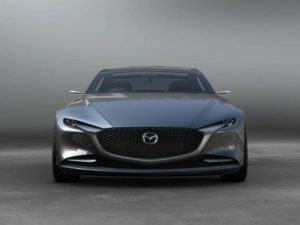 Mazda has confirmed its first electric car will be available with an optional range extender; the first rotary engine fitted to its production models since the RX-8 coupe was discontinued in 2012. Speaking at the company’s new Skyactiv-X engine launch, Jeffery H. Guyton, president and CEO of Mazda Europe, said the company’s first electric car will be introduced in 2019 with either battery power alone or with an optional range-extender. Differing from other range extended vehicles currently on the market, Mazda intends to use its renowned rotary engine technology as a generator to provide electricity. Mazda will also introduce a “mild HEV” (hybrid), in 2019 alongside the EV, followed by a plug-in hybrid in 2021. The latter will likely operate with the new spark-induced compression ignition-based SPCCI engine that offers a blend of petrol and diesel attributes and a claimed 20% improvement in fuel economy over the current Skyactiv-G petrol engines. Further bucking the current automotive trend, Mazda is also working on next generation diesel engines that will launch from 2020. Although other details of the EV, such as battery capacity, are yet to be revealed, the car will be based on the company’s latest Skyactiv vehicle architecture and feature the brand’s “Kodo design 2”; like all Mazda introduced post 2019. The next-generation Skyactiv architecture has been designed around the driver, including enhancements in ride comfort, seat design and NVH thanks to improved torsional rigidity and dampeners positioned around the bodyshell. Mazda is also part of a joint venture with Toyota and Denso, which is co-developing electrified drivetrains for global markets.